PLEASE – it only takes a minute to register. This will be the surest way for you to receive notifications critical to your safety and well being. Simply click on the link below, which will take you directly to the sign up form. Have your cell phone on and with you during this simple process. You may check off any of the groups from which you would like to receive notifications. Once you complete the validation part of registering your mobile phone, the next page will say “Congratulations, you have successfully signed up” You will see a “log in” button for your new account. To complete your registration, open your account and enter your email address [up to two]. Click on the link below to see what the page with your personal account looks like. You may also enter a second number to an additional device you may use [could be of a relative] – it’s all self explanatory. 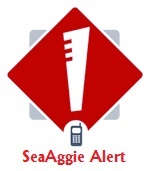 During a Sea Aggie Alert, STAY TUNED TO TEXT, EMAIL, AND FACEBOOK MESSAGES!